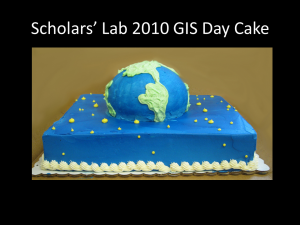 In honor of GIS Day 2013, the Scholars’ Lab at UVa Library would like to invite you to participate in our celebration on November 20th. Starting at 1:30PM in the Scholars’ Lab, there will be a round of lightning talks followed by the cutting of the GIS Day cake. We encourage everyone, including students (UVa, PVCC and high school), in the Charlottesville GIS community to contribute. If you have never seen lightning round talks, they can be pretty entertaining: a rapid fire succession of speakers given a set, short amount of time and PowerPoint slides. In previous years, we’ve had many great presenters giving a powerful message by showing the breadth of disciplines and fields in which GIS is used. In this year’s round, each speaker will be given five minutes with a maximum of ten slides. It is a fairly easy task to create and give a lighting round talk (assuming you can deal with time constraints). Help make this year’s event special by participating in the talks. You can present on anything spatially related you like. It could be about a project you have worked on, things going on at your office or just something of personal interest. If you wish to participate in the lightning round talks, please email cgist[at]virginia.edu. If you cannot participate, please come to enjoy the talks and GIS Day cake and see what we concocted this years’ cake. Previous years’ cakes are documented on our blog. We will wrap up the event by 3:30PM. Please let Chris Gist know if you have any questions or thoughts. Cite this post: Chris Gist. “2013 GIS Day - Wednesday, November 20th, 2013”. Published October 21, 2013. https://scholarslab.lib.virginia.edu/blog/2013-gis-day-wednesday-november-20th-2013/. Accessed on .